During a recent trip to NYC, I met with Richard Zimmerman of Orangutan Outreach and teared up as he shared the atrocities against these furry orange creatures. The palm oil industry is clear-cutting forests and responsible for the dramatic reduction of orangutan populations. As I left our time together at Stumptown I was electric. Something I hadn’t felt since Farm Sanctuary’s End Factory Farming Conference. I texted Tim that we needed to drop everything and head to Borneo. The orangutans needed us. My deep connection to animals traces back to early childhood. There were abandoned cats and dogs that became our family’s beloved pets. Followed by numerous fish, newts, and hamsters. It was turtles that became my first true obsession. Starting with a red-eared baby named Myrtle, I built a small village culminating in a holiday celebration complete with a Christmas tree, carols, and freeze-dried worms stocking stuffers for her and her rescued siblings. I even told turtle stories for all my third grade writing projects until Mrs. Stever (you see I’ve let this go) told me to come up with a new topic. Apparently she, and possibly my classmates, had tired of my turtle tales. The obsession continued with an extensive collection of turtle figurines in pewter, stone, and plaster but no more stories. Or live turtles. They’d all gone to turtle heaven despite vet visits, numerous reptile books, and lots of love. They received a proper burial in our back yard. My next obsession was apes, particularly orangutans although I was also a fan of chimps and gorillas. After watching Gorillas in the Mist as a young girl, I idolized women who devoted their lives and souls to a cause, especially animals. In college I was gifted an annual zoo pass to feed my ape-visiting (okay, stalking) addiction. I was particularly fond of the baby orangutan Mango. I’d drag my poor boyfriend up for regular visits, snap heaps of photos with the glare of the glass caught by the flash, and head back to sorority life revitalized. As if I’d connected to a real world, something much deeper and emotional. Pre-Internet, I sent away for info on gorilla treks in Africa and began saving to meet these giants. Then I moved to D.C., started a business, and my funds and energy went elsewhere. But I haven’t forgotten the gorillas, Dian Fossey, or the way my heart pounds as I get close to the ape house at zoos. (Although I’m not a fan of animals in captivity, I am grateful for the opportunity to see these lovely beings up close). 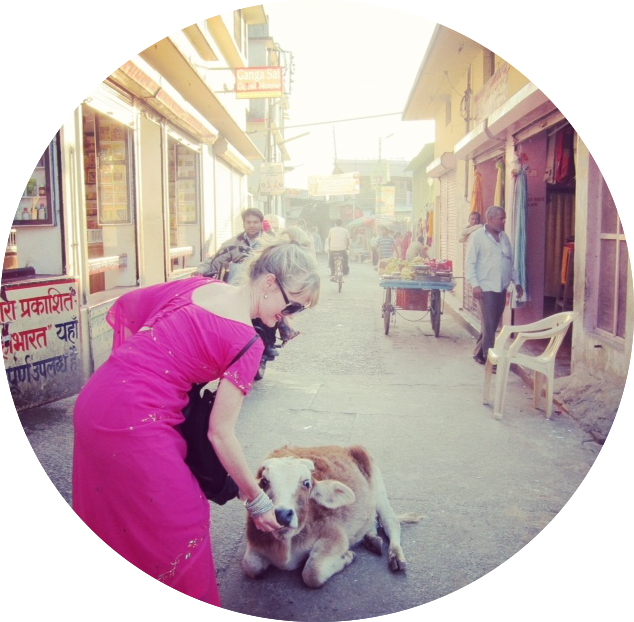 Next came exposure to Farm Sanctuary during my 2007 Jivamukti teacher training. That’s when I adopted couch-sized JD (here he is as a rescued piglet) and have been pig-obsessed ever since. 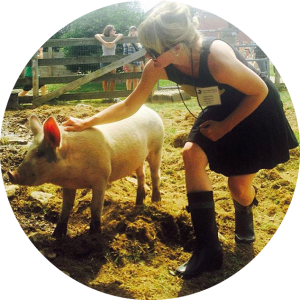 From hosting fundraising and awareness-raising events, to adopting pigs, to hosting film screenings, to feeding them heaps of animal crackers, to craving one of my own. My soul desires all beings be free from suffering. Especially the beautiful pigs. 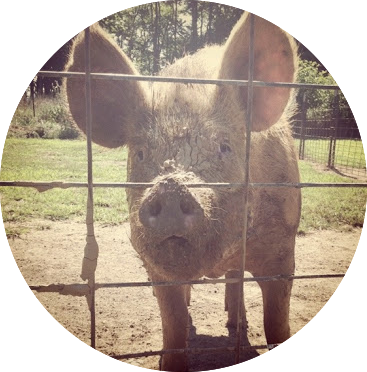 In October 2010, I made my way to PIGS Animal Sanctuary in Shepherdstown, West Virginia and fell in love with a piglet named Walter. He fell off a transport truck in North Carolina—a sad fate for many piglets stuffed into unsafe transport—and was relocated to PIGS. 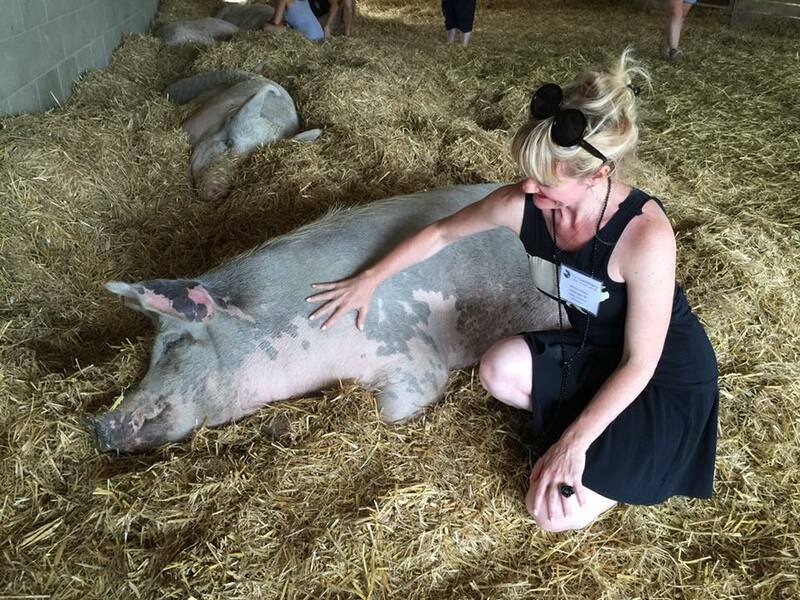 Since becoming smitten with Walter (below coated in mud) I love hosting events to benefit the animals and learning all I can to help stop the unnecessary suffering of these beautiful beings. 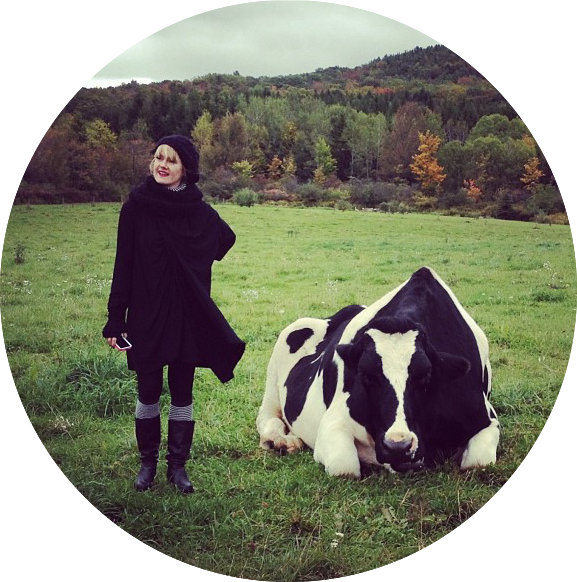 In 2011 I attended Farm Sanctuary’s Animal Care Conference and End Factory Farming Conference. My life was forever changed. The toll factory farms take on the environment, our health, and animals is horrifying. In 2017 Tranquil Space Foundation launched the Pigs & Pugs Project to raise awareness, educate the public, and help fund pig sanctuaries and pug rescues throughout the United States. Stay tuned as we explore adopting more rescues and finding a farmette in the country. A factory farm is defined by Farm Sanctuary as “an attitude that regards animals and the natural world merely as commodities to be exploited for profit. In animal agriculture, this attitude has led to institutionalized animal cruelty, massive environmental destruction and resource depletion, and animal and human health risks.” Sadly, 10 billion animals are slaughtered each year in the US for food. Pigs are our closest relatives at the factory farm. Many never see the daylight, others are used as living breeding machines. Pigs are born and raised inside buildings that have automated water, feed and waste removal. Dust, dirt and toxic gases from the pigs’ waste create an unsanitary environment that encourages the onset of a number of diseases and illnesses, including pneumonia, cholera, dysentery and trichinosis. Hog Farms: As piglets, they are taken away from their mothers when they are less than 1 month old; their tails are cut off, some of their teeth are cut off, and the males have their testicles ripped out of their scrotums (castration), all without any pain relief. They spend their entire lives in overcrowded pens on a tiny slab of filthy concrete. more than 170,000 pigs die in transport each year, and more than 420,000 are crippled by the time they arrive at the slaughterhouse. Many are still fully conscious when they are immersed in scalding water for hair removal. Breeding Sows: Breeding sows spend their entire lives in tiny metal crates so they cannot turn around. Shortly after giving birth, they are once again forcibly impregnated. This cycle continues for years until their bodies finally gives up and they are sent to be killed. My favorite mantra Lokah Samastah Sukhino Bhavantu (tattooed on my inner arm) speaks to my passion for animals. Here’s an essay on the mantra by teacher and activist Sharon Gannon. May all beings everywhere be happy and free. May the thoughts, words, and actions of my own life contribute in some way to that happiness and to that freedom for all. As you consider your breakfast, lunch, dinner, and savory snacks, I encourage you to choose veg. It’s fairly easy, most tasty, less expensive, and healthier. And no animals harmed. A win-win. As I continue to find my way as a cheerleader for animal rights, I know it’s where I belong. The emotion that bubbles up when around creatures is palpable. It’s like I’m home. I come alive and I want to give up everything I have to immerse myself in the cause. Then reality hits. A mortgage is due. There are amazing yogis to be served. And I have a big beautiful furry family that I love. However, if you see an out of office love note posted on the blog declaring I’ve run away to Borneo or a farm sanctuary, you’ll know why. Pigs and orangutans are the new black. Adopt one of your own. Forgo products with palm oil or animals. Let your passionate freak flag fly whether it is turtles, cats, human rights, or the environment. I’ll be right there with you waving my own. My wish is for all beings to have the chance to shine in their natural environment.